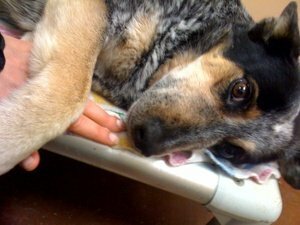 One year after state lawmakers failed to make it a serious crime to torture dogs and cats, they will consider a similar bill introduced in the Senate this session. Senate Pro Tempore Billy Hewes, R-Gulfport, is sponsoring legislation that would make the deliberate torture, mutilation, maiming or burning of a pet dog or cat a first-offense felony. Under Senate Bill 2127, penalties are a prison sentence of up to five years and a maximum $10,000 fine. Such a bill passed the Senate last year but died in the House Agriculture Committee. Mississippi is one of four states and the only state in the South with no felony law that punishes acts of cruelty against dogs and cats. The offense is now a misdemeanor. The exception is dog fighting, which is a felony in the state, carrying up to three years in prison and a $5,000 fine. Hewes’ measure would exempt farming, hunting, veterinary practice, humane euthanasia, the defense of people or property and other practices. A law on the books in Mississippi for almost 70 years already protects livestock, designating “malicious or mischievous injury” to cattle, swine, poultry and other farm animals a felony, Hewes said. Representatives from the Hinds County and Rankin County sheriff’s departments came out to support the bill during a news conference Tuesday at the state Capitol. “We believe that a solid animal-cruelty law is a fundamental part of police work,” said Lt. Jeffery Scott, spokesman for the Hinds County Sheriff’s Department. Sheilah Boseman of Brandon, whose cat was tortured by a neighbor several years ago, said she is for the first-offense felony bill. “I had a cat named Boo, just a big, lazy blue Russian cat. One day, I heard him calling for me, over and over. “I found him on this man’s porch. He had boiled water and poured it on my cat and burned him with cigarettes all day. Eventually my cat died. Opponents of such measures include some members of the Mississippi Farm Bureau Federation. No federation official was available for comment on Tuesday. Former federation president David Waide has said similar laws in other states resulted in interference in the management practices of meat-production businesses. At one point, he said the federation could accept a second-offense felony law. Hewes’ bill is “not an attack on agriculture,” said Lydia Sattler, Mississippi state director for the Humane Society of the United States. “It’s not against hunting or fishing. A felony law would prevent animal abusers from working in schools, nursing homes, day care centers and home health care businesses, said officials with Mississippi-Fighting Animal Cruelty Together. There are no such limitations on animal abusers under current law, said Marlo Kirkpatrick, with MS-FACT. “Our organization is as mainstream as we can be. “People who support the animal-cruelty bill have been accused of trying to open the door for more extreme measures. Animal cruelty has been on the minds of some Jackson-area residents following the death of Rory L. Roark’s Labrador retriever Remy on Dec. 29. Roark reported to Jackson police that he came home to find his back door kicked in and his pet dog lying dead in a pool of blood, apparently shot by burglars. He said he supports a felony animal-cruelty law.